At Elysian Technology, we have a unique vantage point. We get to see customer cloud adoption and trends across a wide variety of industries and sizes. We also get to work closely with manufacturers and distributors to understand their roadmaps for cloud services. SaaS is the gateway drug – When most people hear “cloud” they think of public cloud providers like AWS or Azure. However, we’ve found that most businesses are entering the cloud via SaaS offerings such as Office 365. These models have lower barriers to entry and present less perceived risk. Many organizations are adopting a SaaS first model as opposed to the older public cloud first model. If you are currently using SaaS, your move to the cloud is less of a leap and more of a hop. Backup and DR is driving public cloud adoption – Targeting the public cloud for backup and disaster recovery workloads is also incredibly popular. Many organizations do not have a second site for backups or replication and public cloud solves that problem. For many organizations, their only use of the public cloud is for backup and/or DR (and that’s ok!). But then come the accountants – Imagine trying to decipher the cable or cell phone bills for everyone in your entire organization. That’s what accounting departments are facing when they receive 20+ page AWS/Azure invoices, which makes identifying costs and charging them to the proper department almost impossible. 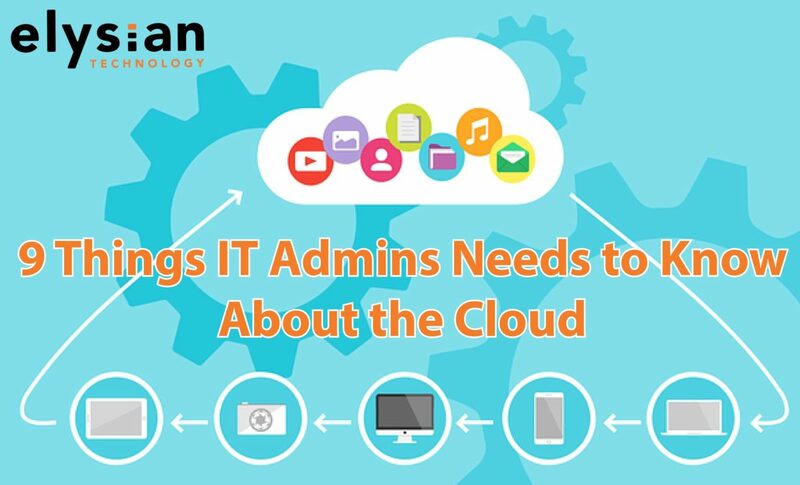 Unfortunately, this has stunted many organizations adoption of the public cloud and frequently requires strict policy or third-party tools to ultimately conquer and control. This situation would be when we’d suggest an AWS health check, to help you sort and organize this information. Security is no longer an excuse for ignoring public cloud – With AWS and Azure boasting a laundry list of ever evolving compliance certifications, the odds are likely that their environment is a step up in security versus a step down. The cloud can be a dangerous place, but that is mostly controlled by you. When you read the “scary” articles about cloud breaches be sure to ask yourself if it still would’ve happened even if it was on-site. Businesses are lifting and shifting – Tech Republic reports 85% of AWS spend is made up of 4 Cloud Services – EC2, EBS, RDS and S3. We are seeing this with our customers as well. Few businesses have the time and money to rearchitect their applications to be cloud native. However, being unable to rearchitect your applications shouldn’t be a roadblock for the cloud. Many organizations have lifted and shifted their servers to learn, experiment, and evaluate public cloud offerings. In fact, the whole idea of the public cloud is to iterate repeatedly. So don’t worry if you don’t get it quite right on the first try and remember, you’re not alone. We’ve helped business of all sizes, in a variety of industries migrate to the cloud. We don’t scare easily, and we’ll be with you every step of the way. Don’t forget, you know how to IT – Frequently, organizations feel paralyzed by the public cloud. Remember, you weren’t paralyzed when you deployed that new software on-prem for the first time. Don’t let the cloud intimidate you. The cloud is LITERALLY built on forgiving mistakes. Also, don’t forget your on-prem tools, policies, or knowledge when you do adopt a public cloud, it’s just another data center. Your staff is about to get more expensive – According to IDC, demand for labor is already constrained and only looks to get worse as graduation rates for Computer Science degrees have only increased 10% over the past 10 years. This means that more budget should be allocated to improving operational efficiencies. Therefore, leveraging automation, cloud and *aaS offerings should be at the top of your priority list. But you’re about to solve more problems – Each cloud offering presents unique strengths and weaknesses. Analyzing cloud offerings on a per solution basis will enable your organization to improve their capabilities and flexibility. With the technology broadening and evolving constantly, the problem you have today could be in your rear view a month from now. The whole idea of the cloud is to be elastic, therefore your cloud policy shouldn’t be static. IoT is here to stay – IoT is the most overused and annoying term in the industry right now. However, IoT solutions are naturally aligned well with public cloud solutions, and the amount of money being poured into R&D is astonishing. Fight the urge to ignore this buzzword, IoT is here and we’ll all have to manage it. How can your business leverage IoT? Hopefully some of these items made you feel a little more comfortable with your cloud journey (or lack thereof). Everyone is moving at their own pace and some people just need a little boost of confidence or experience to take that next step. The cloud is fundamentally different, but if thought of as another tool in your IT toolbox it removes a lot of the stigma and opens up new and unique opportunities for your business. Jay Weier is the Implementation Specialist at Elysian Technology. Jay has been working in the IT space for over twelve years. His career has exposed him to small, medium, and enterprise businesses while working in the private, healthcare, and academia industries. When he’s not on the road solving client’s problems, he enjoys spending time with his new born daughter, riding motorcycles, and skiing.